On a recent ride with my bike club, I got some ribbing about this blog from my friend Marty. (Marty can give me all the flak he wants, because the first words I ever spoke to him, back in’88, were “I have no respect for you,” in a heated moment after he beat me in a bike race.) Apparently referring to my tendency to blog at great length on trivial topics, Marty suggested I write a blog about corn cobs. 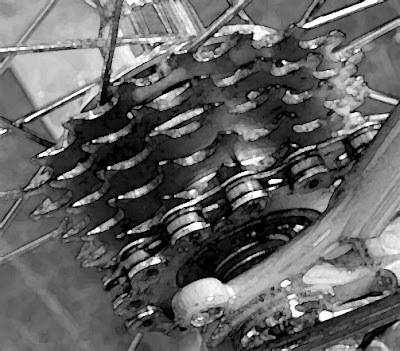 Corn cob, in this context, refers to a rather small bicycle gear cluster in which each cog is just one tooth bigger than the next. This gives a racer great precision--but no range--in choosing a gear to pedal in. "You could write an essay about each cog," Marty teased, "or better yet, you could write a sonnet, an ode to the corn cob!" So, here it is. When I was nine I had a ten-speed bike. And of a spoke protector, even worse. A mean illusion, awful to endure. Of pie plates. Lack of metal was our bling. I got the bike when I was nine. It was a Fuji Junior, bright red, and it’s still on the road today, now piloted by my nephew Jake. That’s him (with his mom), on the very Fuji of my childhood, in the photo above. This was my first bike: my brothers and I were unique in a) being pretty late in getting our first bikes, and b) getting ten-speeds long before any other kids. What a glorious day that was when I had my very own bike to ride and no longer had to run alongside my brothers and their friends as they rode up and down our neighborhood streets. Missing from the Fuji now are the toe-clips. I know I had them because—like everyone—when I first got them I kept forgetting to loosen the straps, tipping over again and again. The bike was not cursed—I was. I wasn’t alone, of course; also cursed was every other kid who was painfully aware of the uncoolness of his bike based on its not resembling a pro racing bike in every detail. Kids—heck, humans—make a lot of trouble for themselves scrutinizing everything and placing it within a rigorous, heartless hierarchy like this. The original tires were 24 x 1¼ inch. (The small wheel diameter made it possible for the frame to be a reasonable 18 inches while still allowing me to straddle the bike.) I dreamed of tires that were only 1 1/8 inch wide, which is what my brothers had by then. Oh, how they lorded that eighth of an inch over me. I became fairly obsessed about it. Eventually my brother Geoff crashed his bike (I believe he was riding at night and hit a brick) and totaled his front wheel. Unable to find a replacement 24-inch wheel, my dad bought a 600C, which had an aluminum alloy rim instead of steel and was thus much better. Not wishing to reward Geoff for his foolishness, my dad put the 600C wheel on my bike and Geoff got my old wheel. This was all well and good until the mandatory bike shop safety inspection a couple weeks before my first bike race, the Red Zinger Mini Classic, in 1981. My bike failed the inspection due to worn-out tires, and the shop only carried the 600C tire in the 1 3/8 inch width! Man, that is really fat. The mechanic lectured me at length about how tire width really doesn’t matter and skinny tires won’t make you go faster. His unspoken assumption was that aesthetics shouldn’t matter to a kid—but why not? I guarantee his tires were nice and skinny! To my great relief, my dad found a 600C x 1¼ inch tire in Denver for me. It wasn’t just the size of the pie plates that rankled us. I couldn’t find room within the sonnet to address the issue of pie plate rattling, so I’ll mention it here. Mine didn’t give me much trouble, but my brothers’ pie plates rattled like crazy. Finally Geoff couldn’t take it anymore and figured out a solution: he took a length of surgical tubing, maybe half a centimeter in diameter, sliced it lengthwise down the middle, and ran it along the edge of the pie plate, so it was held in place by the spokes. This worked for awhile, though the tubing tended to peel off eventually. He solved this by sewing it on there with kite string or dental floss or something. Eventually the tubing turned yellow and brittle in the sun, making the pie plate look more ghastly than ever. As you can see from the photo above, the pie plate on my old Fuji is going strong. I doubt it has ever occurred to Jake to despise it. It seems intuitively obvious to me, as it did when I was a kid, that a larger cog indicates personal weakness. When I really think about this, I see that math is involved, and it wasn’t until I read my sonnet to my wife, Erin, that I realized how much I take for granted when it comes to the proportions of bike components. Imagine: she can look at a large freewheel and not pity the bike owner at all! But then, she didn’t have, as a pre-teen, a gear chart taped to her stem, showing which front/rear gear combination represented the next highest or lowest gear. Bryan, at fourteen or so, actually wrote a computer program to plot the gear inches on a logarithmic scale. Gear inches refers to the number of teeth on the chainwheel up front, multiplied by the wheel diameter in inches, divided by the number of teeth on the rear cog. 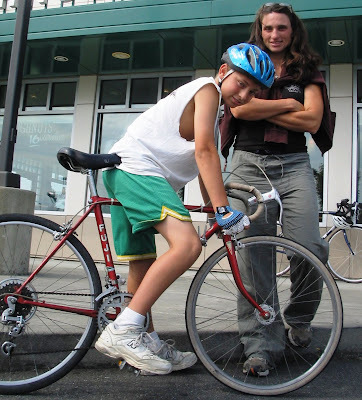 Any teenager I rode with then knew by heart not only that, say, 52 x 13 was a 108-inch gear, but exactly how fast that gear would propel him at top cadence. Bikers were nerdier then, I think. When I started racing, my brothers helped me strip down my bike, ditching the reflectors, replacing the stem-mounted shifters with down-tube ones, and removing the so-called “chicken” or “suicide” levers, those brake-lever extensions that made it possible to brake while riding on the tops of the handlebars. I distinctly remember Geoff, at age thirteen or so, sawing off the chicken-lever stubs with a hacksaw so the bolts would sit flush. We/they also removed the chain-guard on the crankset, which now strikes me as a step down aesthetically (it was a giant, pretty, chrome thing, and I remember well how often I had a grease print of the chainring on my pant leg after the chain-guard was gone). The rear mech is a Suntour V-GT Luxe, which my dad installed along with a larger freewheel to give me—you guessed it—lower gearing, which of course was a bit humiliating. Why me? Was I such the runt that I alone needed lower gearing? Oddly enough, the larger freewheel actually made the pie plate look smaller—but just try telling my brothers that. The bike never did shift very well after that “upgrade,” which is why in races I’d often get dropped in either the highest gear or the lowest. This doesn’t mean I didn’t get dropped when using other gears—I mostly used those two gears, and always got dropped. When I upgraded from the Fuji to my first Miyata, I went from a 32-tooth large cog in back to a 28, and I was thrilled at the sleeker, racier look. It still had a pie plate, but it was aluminum, and not as shiny, thus less conspicuous. A couple of years later I bought some wheels from my brother Geoff that had the same 28-tooth cog, but with no spoke protector. That was a huge step forward; I think my ego doubled that day. At age fourteen I started racing in the United States Cycling Federation races, where your smallest cog couldn’t be smaller than 17 teeth—far lower maximum gearing than I’d been riding in the Mini Zinger. (The idea was to save the youngsters’ knees.) It was practical to run a straight-block freewheel with that limitation; even with only six cogs, you could do 17-18-19-20-21-22, with 22 being a totally reasonable gear for getting up just about any hill in the Boulder area. The next year I moved up an age group and was allowed to have a 15-tooth cog, and I went to the new Suntour 7-speed freewheels, and had an almost-straight-block of 15-16-17-18-19-20-22. Still, a 22 was the freewheel cog equivalent of sensible shoes, and I wanted something more bold. Finally, I switched to Shimano gear cassettes and for the first time could easily create custom combinations for specific races; for example, if I was racing with the adults I could use a 12-tooth cog. At last, I could build the highly impractical gearing combinations that fully satisfied my vanity: for criteriums or bike club photo-shoots I’d set up a 12-17. (Shimano wasn’t doing 7-speed yet.) What a rush that was as a teenager, to look down and see not a giant cluster with a humiliating pie plate, but this tiny little freewheel, a man’s freewheel, a svelte cluster fit for a real racing bike, and above all a highly visible manifestation of my strength. It was like the bicycle equivalent of giant muscles. It never occurred to me that to most people, perhaps even to you, it’s just a bunch of damn sprockets and whatnot that don’t really mean anything. So did I outgrow all this macho nonsense? Of course not. I still snort at pie plates (though they’re made of plastic now). After a couple of months of dating Erin (back in ’92) I quietly removed the pie plate from her mountain bike. (She never noticed.) 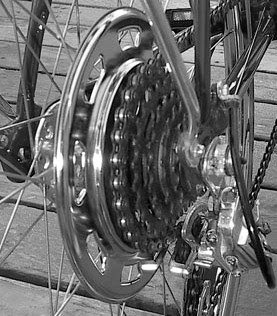 As for gearing, the modern-day equivalent of a giant rear cog is of course the triple front chainwheel, which accomplishes the same thing (i.e., addresses the same weakness). A triple requires a longer derailleur cage, which I equate—with a shudder—to that old V-GT Luxe on the Fuji. If a friend, new to cycling, asks me about triples, I’ll tell him they make sense given the hills around Berkeley. But a triple for my own bike? Are you kidding? Never! What about compact cranksets...AKA the venerable 110 BCD immortalized by the Sugino Mighty Tour crankset (http://www.flickr.com/photos/25373440@N00/1510140166) -- how do these rank on your machismo scale, then vs. now? Bravo... I do believe, however, that Bikesnob has forever aptly renamed the spoke protector as a "pie plate"
Marty, the Sugino Mighty Tour is a venerable old crankset, and I respected it both back in the day and at least as much now. But the problem with the compact style (whether both chainrings are small or just the inner one), which is clearly visible in the photo journal you reference, is that you need that long-cage rear mech. That just spoils the macho factor. This setup is better than a triple, of course, with its grotesque proliferation of chainrings and that ungainly front mech, but it's still not as cool as a 39, 40, or 42 front ring coupled with a corn cob. The coolness lies in the very impracticality of the tall gearing. To put it another way, we cannot both a) be badasses, and b) subscribe to "Prevention" magazine. I think I'm with your brothers on the coolness of the French vs. Japanese bikes. This is in light of the fact that my first "racing" bike was an early-1980s, low-end Peugeot. That baby had steel rims, brake levers with zero padding (I mean bare plastic), and a magic-box-style front mech. Oh, what a beauty. I remember my first ride on Morgan Territory with her--the one I almost didn't survive. Since you are a Pro-Wrench -- wondering if you can help me service it and get it spinning -- it is completely frozen now -- and then you can take your own pictures. I can even lend you a bike if you need on-the-bike model. Marty, I love the freewheel! That is a real honey. I'm practically jealous, though I have some sweet Regina corncob somewhere that could hold its own. As for your other link, I checked it out back in June '09 and reviewing it now I'd say your fleet has grown. Good on ya!